Thanksgiving means many things: spending time with family, reflecting on what you’re thankful for, looking back at American history. But the essence of the holiday can be stated in three words: food, football, and parades. 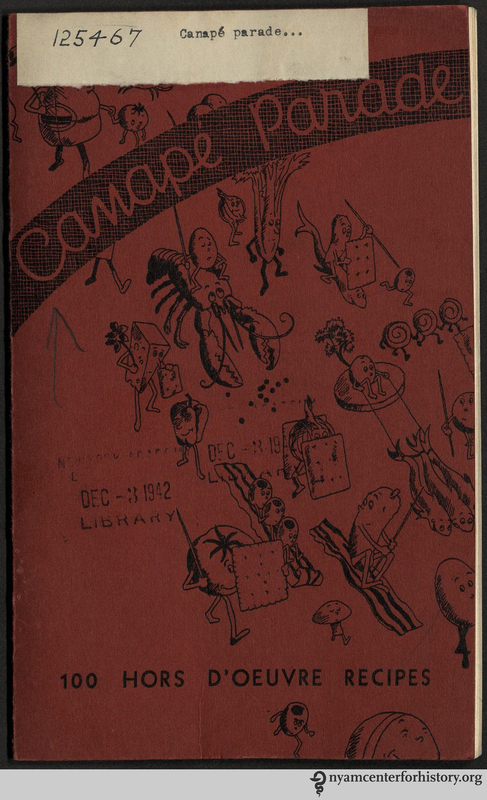 The cover of Canapé Parade. The personality-filled canapés from the cover reappear throughout the pamphlet, illustrating recipes like bloater paste, Japanese crabmeat, herring, and marrons in brandy. Unfortunately, the pamphlet does not credit the illustrator. For more traditional Thanksgiving recipes, read Thanksgiving, 1914 Style. This entry was posted in Collections and tagged Canapé Parade, cookbooks, cookery, food, hors d’oeuvres, illustration, recipes, Thanksgiving, Thanksgiving Day by nyamhistorymed. Bookmark the permalink.